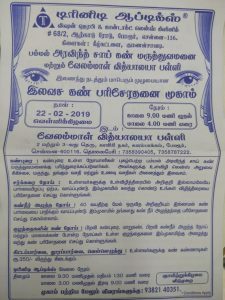 CHITLAPAKKAM near Varadaraja theater Organised by District Blindness Control Society, Kanchipuram. School Eye Screening Camp at ANNAI SHRINE THERESA, ANAKAPUTHUR. TRINITY OPTICS at VELAMMAL VIDHYALAYA SCHOOL, Karambakkam. Public are requested to get benefited by the Camp.